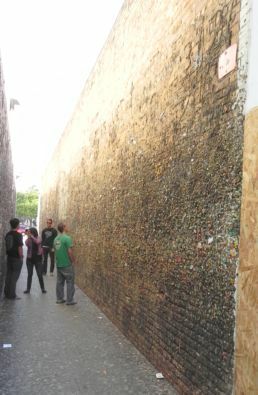 The Alley in San Luis Obispo Filled with Gum! Bubble Gum Alley - This unusal alley located in San Luis Obispo, California is absolutely gummy. I have never seen anything like this in my life. My first thought was, YUCK, I mean it was gross. Two walls pasted with old gum from peoples mouth. My second thought was, "I wonder what sort of diseases are resting on this wall." Of course I didn't touch anything but still..Lord have mercy, gum stuck on a wall in down town San Luis. Yet, much to my own dismay there happen to be many curious on lookers gazing at the disregarded pieces of gum. it is reported, in or around the early 1960's, a few pieces of gum began to show up on the wall. Oh yeah, I forgot to tell you were this weird wall is located. 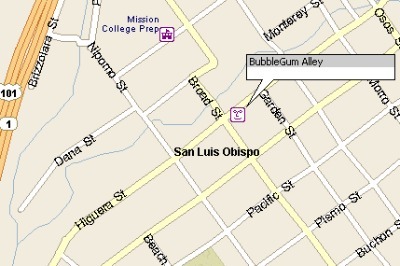 Bubble Gum Alley is located in the downtown area of San Luis Obispo. It is not too hard to find. The wall is on Hiquera Street just a little North of Broad Street. All you have to do is watch for people NOT CHEWING gum. That's right, not chewing gum because they posted all the gum on the wall. If you look at the cross streets it will help you find this odd attraction in San Luis. Honestly, my wife and I found the wall extremely interesting plus there was a little dog shop next to the alley and we are looking for a stroller for our two Shih Tzu dogs. 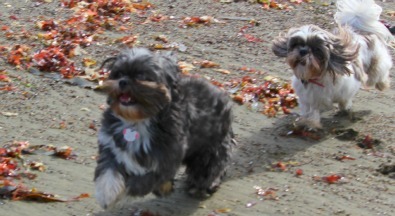 The dogs are running because I was trying to stick a piece of bubble gum alley, gum on their nose. I hope you enjoy this little adventure into down town SLO and when you have a moment take a look at the rest of this site.